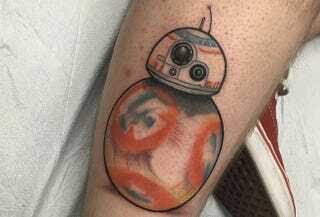 People are already tattooing new Star Wars characters onto their appendages—because it's Star Wars! Fingers crossed the new ball droid showcased in the Star Wars: The Force Awakens trailer doesn't wind up killing Han Solo. According to the Instagrammer Jordan Breckon, this tattoo was inked by Tyler Nealeigh. Hey, it looks great, and the movement on the piece itself is very pretty. All we can say is, shine on, you crazy Star Wars-loving diamond.